Successful lustre decorating begins with the greenware, which should be carefully cleaned and bisque fired to at least 1000-1080°C. This encourages the dissipation of gases which otherwise might cause imperfections in the onglaze and also makes crazing less likely. The areas to be lustred are then glazed and fired. The firing should be to the highest temperature recommended for the glaze. This is to fire out as many imperfections as possible which could mar the lustre finish and to help inhibit crazing. Keep in mind that a satin or matt glaze will provide a satin or matt result to the lustre or metallic, and a gloss glaze will furnish the glossy result more commonly associated with lustre finish. Lustres are fired on Earthenware Glazes @ 700°C and on Porcelain Glazes @ 800°C, which is the temperature at which the lustre reacts and combines with the softened glaze surface. 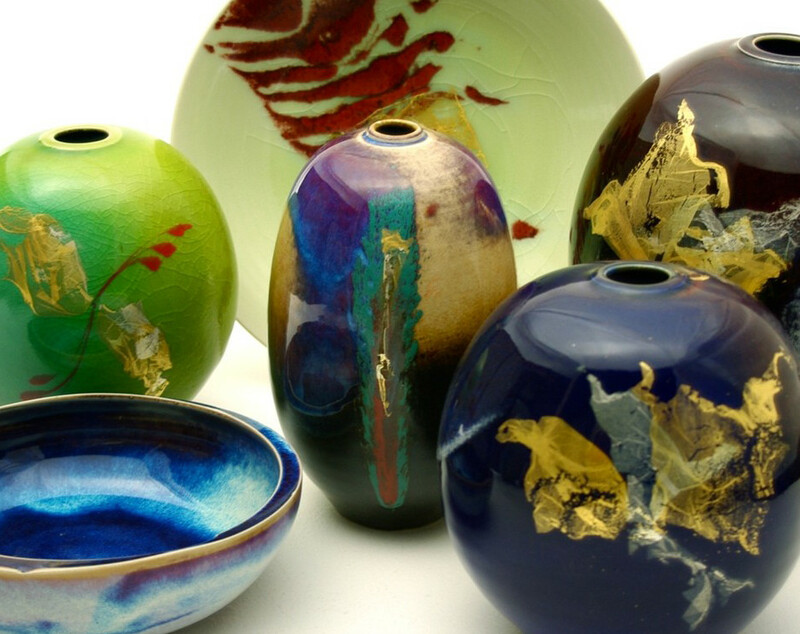 Over-firing will cause the colours to sink too deeply into the glaze, resulting in distortion, fade-out or burnout. Under-firing will prevent the glaze from becoming soft enough to receive the colour, thus causing poor adhesion. Brush technique is important. The brush should be saturated but with the excess material worked out. Each stroke should be firmly and evenly placed next to the last one in an effort to make the application as even as possible. The two exceptions to this are the Opal and Mother of Pearl lustres. These should be applied evenly. This is best accomplished by swirling or stippling the lustre with the brush during the application. However these, as well as the others must be applied thinly. Square brushes are recommended for lustres. Where an even edge is required, or the decoration is to be applied to a raised or embossed surface, the lustre may be allowed to thicken slightly. This is accomplished by exposing a small amount of material to the air on a glazed tile or glass. This slight thickening may be advantageous where added brush control is desirable. The material can be thinned again with Essence (either Gold or Lustre). Add one drop at a time to avoid over thinning. Halo Lustres and Metallics should never be thinned. The solvents in these products must be present in exact proportions, therefore every effort must be made to ensure that as little evaporation as possible takes place from the containers of Halo Lustres and Metallics. Brushes that are used for lustres should be kept thoroughly clean and must be protected from contamination between each use. It is highly recommended that one brush should be set aside for each metallic preparation and be so marked. A brush used for Mother of Pearl should never be used to apply any other product, with the exception of Opal. Wash brushes in Lustre Brush Cleaner. For application of lustres by sponge, allow the lustre to thicken slightly by exposing a small amount to the air as described above. A thickened material will hold the sponge pattern after application. Use a small piece of natural sponge and discard after use. These colours contain lead, cadmium and other metals which may be hazardous to health if swallowed. It is important to store these colours safely away from children. Do not smoke, drink or eat when working with these colours.